They're old, gray and . They're gray. They're approaching retirement — but But the Marine Corps' EA-6B Prowlers are they're still fighting terrorists. The service's Marine Corps' aging fleet of jets used for electronic warfare EA-6B Prowler have flown hundreds of hours over Iraq and Syria in support of the fight against the so-called Islamic State group. militants. They may be some of the final combat missions for Prowler squadrons before the Corps starts to retire the aircraft and adds electronic warfare capabilities to a variety of platforms. Changes in the electronic warfare community will begin this year as officers who spent their careers in the Prowler enter unmanned aerial vehicle squadrons and the Corps tries to make electronic warfare more a more ubiquitous part of combat. Until then, however, the Prowler is helping coalition forces in Operation Inherent Resolve as the Corps' primary electronic warfare platform. 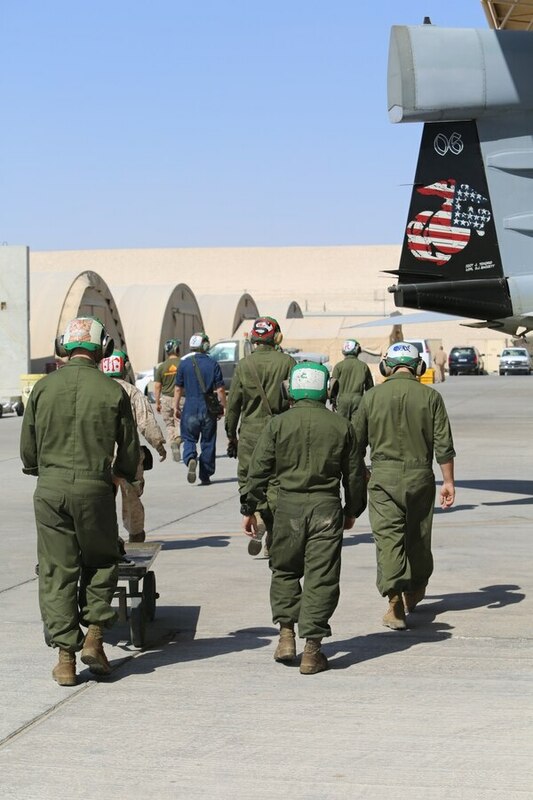 Marine Tactical Electronic Warfare Squadron 3, the "Moon Dogs" began missions into Iraq in June 2014. And in August, Marine Tactical Electronic Warfare Squadron 4, the "Seahawks" relieved VMAQ-3 and soon began sorties over Syria. "We were the first USMC aircraft in Syria on the first wave of strikes, and have continued to support strike packages, air drops, and other electronic warfare requirements as directed by the Combined Force Air Component Commander," said Lt. Col. David A. Mueller, VMAQ-4's commanding officer, Lt. Col. David A. Mueller, said. His squadron is currently attached to Special Purpose Marine Air-Ground Task Force-Crisis Response-Central Command, which stood up in October and is based in Kuwait and other countries within U.S. Central Command. "Our Marines and sailors are very proud to be part of the recently established SPMAGTF, which is historic in our community due to the fact that an EA-6B squadron has not been part of a MAGTF in combat since 2003," Mueller said. "While our tasking comes directly from the CFACC, we are routinely tasked to support SPMAGTF elements in Iraq." Members of Marine Tactical Electronic Warfare Squadron 4 return to their work areas after launching an EA-6B Prowler to conduct aerial maneuver training in the U.S. Central Command area of operations. The Seahawks have flown more than over 110 sorties and logged 800 flight hours in OIR, Mueller said. They've supported coalition forces' air strikes and provided electronic warfare support in both Iraq and Syria against Islamic State militants. They've also helped Iraqi ground forces during attacks and degraded the enemy's use of systems that rely on the electromagnetic spectrum, Mueller said. The squadron is operating with five Prowlers. 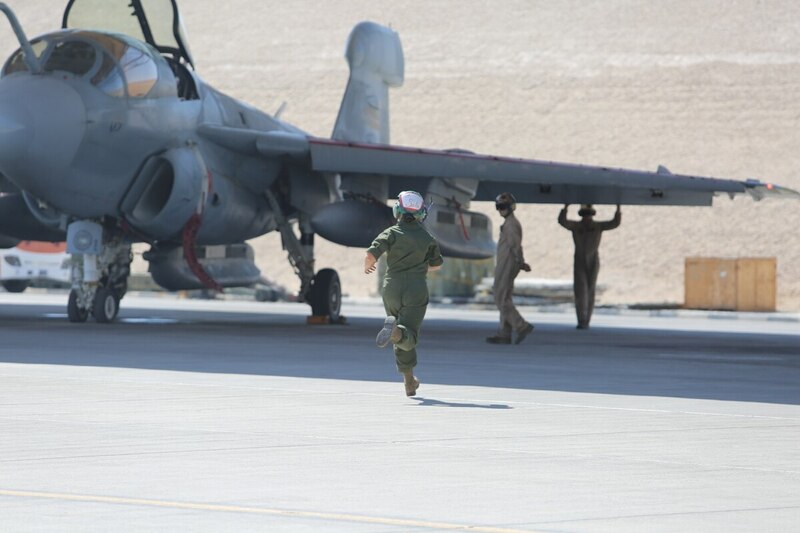 Marine Corps officials would not say where the Prowler sorties are originating out of consideration of a host nation. While Prowlers can be armed with munitions, they have not dropped ordnance during this operation, Mueller said. Dakota Wood, a retired Marine officer who now an analyst at the Heritage Foundation, said Prowlers have several roles in combat missions. Using pods attached under-wing, they can detect and identify an enemy's electromagnetic signals. If an enemy is using radar, they can jam the emission, making it possible for coalition aircraft to fly undetected toward a target for a strike. They can also jam the enemy's communications, including that communications between enemy weapon systems, making it tough to coordinate an attack. And Prowlers can also identify where electronic emissions come from, making it possible to map the enemy's location. The aircraft, while well-used, is still a relevant weapon, Wood said. "It is capable, but the platform itself is aging," he said. "Its capabilities are still relevant … but the airplane itself can only have so many flight hours on the airframe." he said. The Corps has 27 of the aircraft in the fleet, and, on average, each airframe is 27 years old. They're the second-oldest fixed-wing aircraft in fleet operations, younger than only F/A-18 Hornets, according to the Corps' 10-year aviation plan says. The Navy also flies Prowlers bit is replacing them with the EA-18G Growler, an electronic warfare variant of the F/A-18 Super Hornet. The Navy expects to convert its remaining Prowler squadrons to the new aircraft next year. The Corps, however, has a different approach. Leaders plan and going to use the F-35B as its primary fixed-wing electronic warfare aircraft. At the same time, it's also adding electronic warfare capabilities to platforms across the service. Marine Air-Ground Task Force Electronic Warfare is responsible for handling this mind-shift. It's charged with using fixed-wing, rotary-wing and unmanned aircraft, as well as ground-based electronic warfare systems, cyber systems and emerging technology to integrate electronic warfare capabilities on platforms across the Corps. "This integration of manned and unmanned airborne and ground EW capabilities will provide the MAGTF commander with greater flexibility and control of EW than he has ever had before," the Corp's 10-year aviation plan states. Some of the changes in electronic warfare will begin this year. EA-6B electronic warfare officers will start transitioning to unmanned aerial vehicle squadrons. Meanwhile, the unmanned aircraft systems officer and electronic warfare officer occupational specialties will merge. Some current technology will be carried forward. The intrepid Tiger II, a jammer pod used on Prowlers and AV-8B Harriers, will go on rotary and unmanned aircraft. Wood said the electronic spectrum is used in the battlefield in ways that nobody envisioned when the Prowler entered service in the 1970s, so it's imperative to expand electronic warfare capabilities across the Corps. Cellular technology, for example, is a newcomer to combat and is used by enemy ground forces to launch and coordinate attacks. This new capability means that the Corps needs to control enemy signals whenever and however possible, he said.